So what makes resilient vinyl flooring so versatile? Well, the product is resistant to water, mildew and stains. This means it can go in any room of your home, including bathrooms, laundry rooms and basements. Many of us love hardwood floors and want them throughout the home. But when we get to these rooms, the real thing is not a great solution. 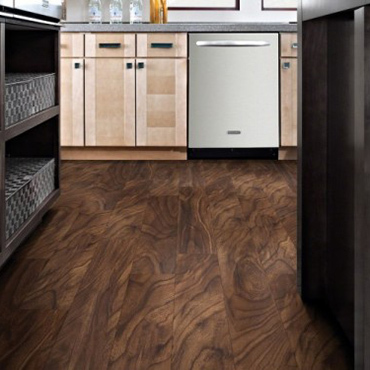 With vinyl flooring you can select a pattern that replicates the authentic look of hardwood and you don’t have to worry about moisture, buckling and yucky mildew! Design of vinyl flooring has come a long way and is extremely stylish compared to styles from years past. It is available in a variety of colors, styles and finishes. Our design team can simulate the look of any number of flooring types such as hardwood, tile and stone. The visual is created from photos so we can literally morph any image and transfer it to the product. Once the image is transferred and the product is created, we can add textures that will create a look so natural and realistic no one will ever know the difference. If you haven’t looked at vinyl flooring as an option for your home lately, you may want to reconsider. This product will not let you down. It is versatile, stylish, durable and affordable. With the numerous benefits we have to offer, you’ll see why we put the “luxury” in luxury vinyl flooring.